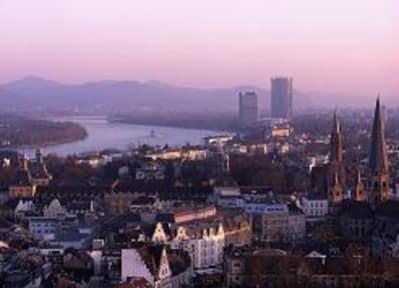 Bonn has an exceptionally broad cultural range to offer to guests. Museums presenting history, politics and the arts bring the past of the Federal Republic of Germany to life. 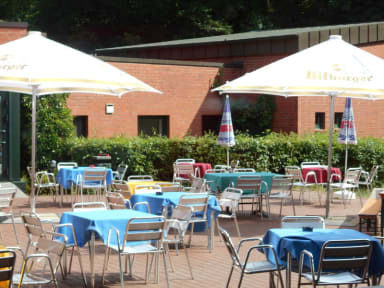 Bonn-Venusberg Youth Hostel is the ideal starting point for all sightseeing and excursions. Secondary schools, companies with trainees, clubs and organisations will appreciate the easy-going atmosphere at the hostel. Conference guests will benefit from its excellent technical equipment and competent service at the hostel. Bonn-Venusberg Youth Hostel offers all modern comforts to guests. The light and generously-proportioned sleeping quarters create a friendly atmosphere. All rooms have their own shower and toilet. The modern bistro and large patio are interesting meeting points for talking and relaxing. All areas and facilities of the hostel are suitable for handicapped people. TV room, bistro, lounge with open fireplace, bicycle cellar, garden patio, barbecue facility, table tennis, drying rooms for cycling gear. Youth Hostel Membership Card: To use our hostels, you need a membership card issued by the youth hostel association of your home country. Please contact your national office. Your national membership card is valid for local and international travel if your country is a full member of the International Youth Hostel Federation (IYHF). If your country is not a full member of the IYHF or you have been living in your country of residence for less than 12 months, you can buy a Hostelling International 'Welcome Stamp'. This enables you to use the hostel facilities - you can purchase one stamp each night (EUR 3,10 per stamp) you stay in a hostel, or purchase all six stamps at once (EUR 18,60). With six stamps, your card is valid for 12 months from the date of issue. Information for families: Both parents will need an individual Hostelling International Card. Any child in that family under 18 years will be covered by the parent's Hostelling International Card. If you have lost or forgotten your national membership card and have to buy a Hostelling International Card no refund is possible according to the IYHF guidelines.